The sign behind her reads: Introducing The First Conversation-Ready Barbie Doll. You Talk, She Answers. 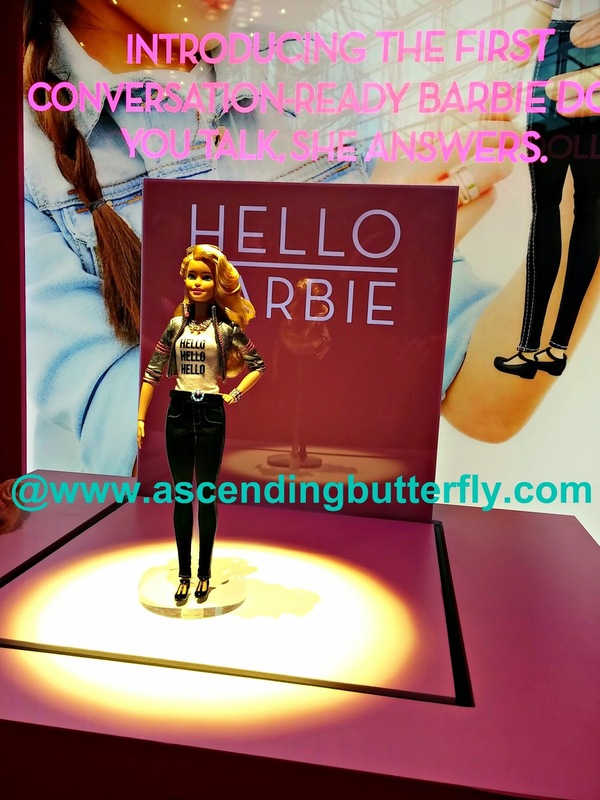 Hello Barbie, a talking Barbie Doll was unveiled by Mattel during Toy Fair which I attended this year, I had the chance to watch the demo of her and experience the doll which can have two way conversations first hand. While Gwen Stefani may be no one's 'Holla Back Girl', apparently Barbie will be as this popular doll gets a digital makeover, can you say Barbie 2.0? This internet-connected version of the doll can tell stories, crack jokes and listen to her owner speaking and gradually respond to particular questions and statements over time. A prototype of Hello Barbie which is estimated to retail for $74.99 was unveiled during Toy Fair, developed by ToyTalk and will have an hour's worth of playtime built in. Initial questions it would ask would be about favorite colors and school, then the doll which utilizes Speech Recognition would collect users' replies in the 'cloud' would answer and interact with the child. Release Date was not revealed but I am sure she will be on shelves during the 2015 Holiday Season. You can google Hello Barbie or even read the comments on her early un-veiling You Tube Videos to see that she comes with quite a bit of controversy and she has not yet hit the shelves! Privacy Advocates are discouraging and trying to dissuade parents from purchasing her, and many claim it is the wave of future with more toys embracing an interactive format. Protecting your child in this digital age is certainly a complex task in and of itself, but with Barbie already representing fields like Scientist, Mathematician, Writer, Painter and more, isn't it about time she actually talk? While I am not a mom, I am a huge fan of Barbie and find her new evolution fascinating, I am sure I would have wanted one as a child! Parents: Sound off - Will you be purchasing Hello Barbie for your daughter? Why or Why Not? FTC Disclosure: This is NOT a sponsored post, no monetary compensation has been received, and all opinions are 100% my own! I was given press access to Toy Fair 2015 for Editorial Consideration. I am disclosing this in accordance with the Federal Trade Commission 16 CFR, Part 255 - Guides Concerning the use of endorsements and testimonials in advertising, you may check our Giveaway and Disclosure Page for additional information regarding Ascending Butterfly Disclosure. So where was Ken? heheh! I played with Barbies ALL THE TIME when I was a little girl. Now I have all boys, so there are no barbies in our house. My niece would love this. She's getting older, but she still loves to play with Barbies. This sounds interesting. I am sure my six year old niece would love this Barbie. Oh my. That's almost creepy. I don't know how I feel about this Barbie. On one hand, I think it is kind of neat, but I also wonder if it is a privacy concern as well. How awesome is that!! I LOVED Barbie as a kid! My daughter won't be born till September but you can bet she will have TONS of barbies! I loved Barbie's as a kid! I'm surprised my girls aren't really into them. Make some kind of sad I saved a ton for them and they had no interest. I have been playing Barbies since I can remember and always enjoyed my experiences. I would definitely be interested in seeing this new concept first hand. So glad all my girls are well and truly past the Barbie stage. This is a really interesting post. I have not heard of Barbie 2.0 yet. I will have to see how the final product turns out. My girls have a lot of Barbies, but go through waves of playing with them. If they were big Barbie fans, I'd consider purchasing one. This is such an interesting read and its hard to decide where I stand on this barbie. There are definitely pros and cons of a toy like this. It's amazing how far technology has come in the toy world. Well I always loved to play with Barbie and so did my daughter ( who's a bit to grow now !) . This Barbie sounds exciting but I would be a bit worried about info. , being sent to the " Cloud" I'd have to check it out further ! She is so cute! My daughter has so many Barbie Dolls. Barbie sure has come a long way since I was a kid! I think my daughter would love this! I have love Barbie dolls ever since I was a child. This latest one is totally cute!